The teeth whitening treatments at O Dental allow you to conservatively enhance the aesthetics of your smile. They don’t require modifying the teeth themselves; only a slight colour alteration allows you to improve any staining with a simple procedure. In-chair whitening. This type of whitening is ideal for those who want to kick-start the process and have limited time. It works well for those with a big event coming up such as a wedding or for people who can’t take much time off work. 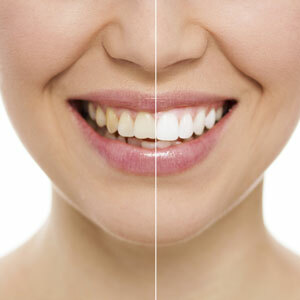 The Zoom whitening system is highly effective, taking 20 minutes over 3-4 cycles. Your teeth can be made 8-10 shades whiter in a single appointment. At-home whitening. Done at your convenience in your home, a concentrated bleaching gel is used. It can be combined with in-chair whitening for incredible results. Comprehensive whitening. If you have deep stains and enamel irregularities, Dr Caroline Oh (Dentist) will customise a treatment that is tailored to your needs. Find out what we can do to achieve the smile of your dreams. Contact us today to find out more about teeth whitening in Zetland and Waterloo, Kensington, Rosebery & Darling Square!